James Law JP, is an architect, technologist and entrepreneur. 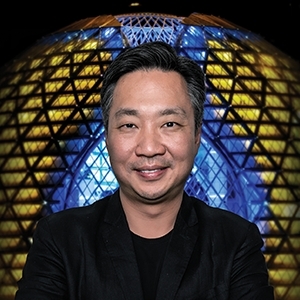 Renowned for creating the philosophy of Cybertecture in which a better world is designed with technology to alleviate suffering for mankind, his company's projects cover buildings, spaces, technologies, education and social design. James Law is the architect of the world renown OPod Concrete Tube Housing Project designed to alleviate affordability problems for mass housing; architect for The Pad Tower - the world's first Apple iPod inspired building in Dubai; and architect for the design of the world's first commercially run Hyperloop by Hyperloop TT. Cybertecture Academy is an education institution providing courses in architecture, design, innovation and technology to a wide age group from students to professionals and institutions.